7.41 points at 22 votes (rank 234). Rombachs C64-Spieleführer 10 September 1984 - "Crème de la Crème"
"Colossus Chess is the best computer chess programme available on any home computer. It is written using the very latest techniques by a computer chess programmer of seven years experience." 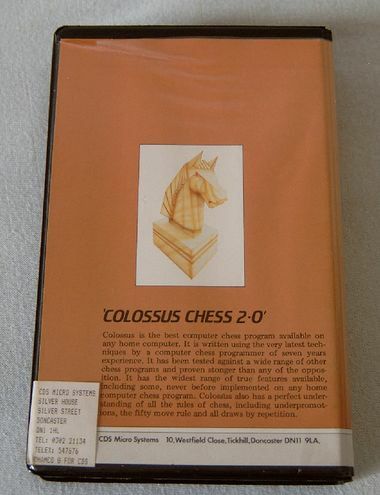 (Quote: Rear side of the package of Colossus Chess 2). 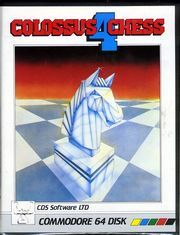 The chess programme Colossus Chess is available for many computer systems and in different versions. All chess rules, inluding the fifty-move rule, are contained. Furthermore, Colossus offers many setting options and interesting game modes. For Colossus Chess the designers have chosen a relatively simple 2D chess board. The occasional peep as the only sound may be not very spectacular, but in return more memory was left for coding the AI (which is the intelligence or respectively the strength of the computer). Let's go. The horizontal bar marks the position on which the player's "hand" currently is; here it hovers over field a1. Controls: You can either navigate comfortably by joystick, with the cursor keys and Return or with entering the letters A-F and the numbers 1-8. In both the latter cases you first choose the pawn, then confirm with Return . Then you mark the target field and confirm again with Return . If the move is allowed, it will be done after three high peeps and it is the computer's turn. If the move is not allowed, this will be indicated by a lower peep and the prompt starts again. 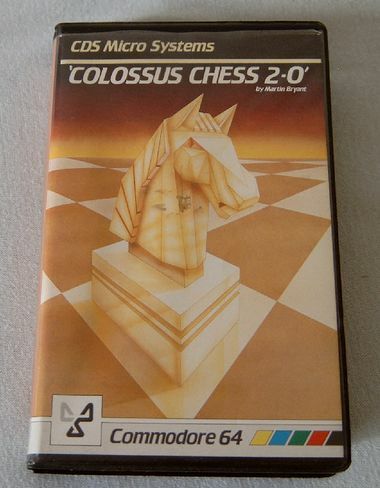 The computer or AI in Colossus Chess counts as one of the strongest software chess simulation for the C64. Rooks (in the corner) move as many fields as desired vertically or horizontally. The knight (next to rook) moves two forwards plus one to the side or vice versa. The bishop (next pawn inwards from the knight) move as many fields as required diagonally. The queen (big crown) can move as many fields as required diagonally, horizontally or vertically. The king (small crown with cross) moves one field in any direction. Note: If you are in check (king is threatened), every move that does not bring the king out of check or protects it by another pawn is not legal. The game normally ends when a player is checkmate, which means that his king cannot be manoeuvred out of check (see image above, white king is threatened by the queen and rook in black and there is no way to remove it). 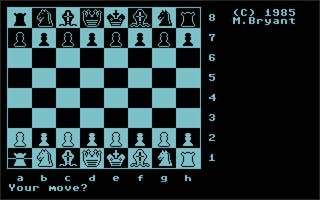 Shakermaker303: "Normal chess game done without much effort or graphics ornateness. I found it rather hard to play against the computer and I always lost. 6 out of 10 points are probably adequate." TheRyk: "I disagree. Of course, graphics are simple, but diffculty, i.e. the quality of AI is what makes a good chess program. Graphics-loving occasional chess players should pick... uhm... other titles such as Battle Chess. For patzers Colossus might be a little frustrating initially, but only through defeats you learn the game. Controls could be a little more comfortable, e.g. a display showing the possible moves of a piece might have been desirable. But since I know no better software chess AI than Colossus, my bottom line is 8 out of 10." Bergo79: "I can only agree with my previous speaker. 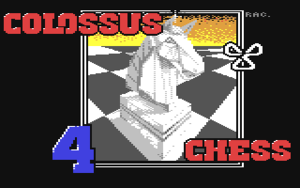 If you leave out the Final Chesscard (which is not a software in the classical meaning), then Colossus Chess 4.0 is definitely the strongest chess programme for the C64. From me 9 out of 10 points. Einotaruk: "I have experience with Colossus Chess 3.0. It is strong on Blitz, but when you ignore time and play it deeply, then you can easily outplay it. Even as mediocre player. Its endgame is stronger than mid-game. And yes, sometimes it does make BLUNDERS that costs it major pieces! Incredible! I have forked it more than once." 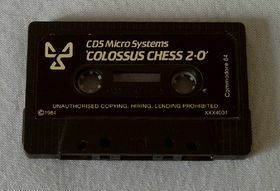 "Colossus Chess 2" was also sold together with the games "Silicon Warrior" and "International Soccer" as a cartridge named "Super Games". A highscore does not make sense. This page was last modified on 5 December 2016, at 13:09.